The Light Mill never reached the popularity of the Drinking Bird or Newton's Cradle, but chances are you've seen it. It looks like a light bulb with four spinning paddles inside. Although no power is pumped through the mill, it spins as long as light hits it. Find out how these little mills work, and how some day we might use them to jet around nebulae. The Light Mill is one of the many toys that were invented well before anyone knew how they worked. And ultimately, they turned out to hold the key to a source of energy we might one day exploit when we're a fully space-going species. The first Light Mill was built by chemist William Crookes in 1873. It's a small enclosed bubble of glass that has had most of the air pumped out of it, with four little squares of metal attached to a rotating weather-vane-like contraption inside. One side of each paddle is painted black while the other is silver. As soon as light hits the Light Mill, the paddles begin to spin. The black side of the paddle always turns away from the light and the silver side always turns into the light. Crookes called it the Crookes Radiometer, but it became more well-known as the Light Mill, because he believed that the pressure of the light on the black side caused the paddles to turn. He was not correct. 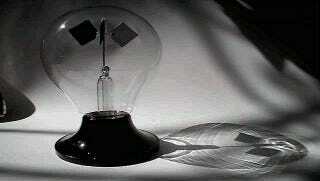 Since black absorbs photons and silver reflects it, the silver should turn away from the light. Photons exert pressure on a substance when they're absorbed, yes, but when they bounce off, they impart twice the pressure that absorbed photons do. If it were photon driven, the mill would turn the other way. Any debate on that question was silenced when it was found that, when all the air was pumped out of the mill and there was only a vacuum inside, the paddles stopped turning. If light were the medium turning the paddles, they would turn faster in a vacuum. Clearly the sparse amount of gas inside was turning the paddles, but how? It took six years and many wrong guesses for someone to finally come up with the answer. In 1879 Osborne Reynolds came up with a little thing he called 'thermal transpiration.' If a porous plate is suspended in an evenly-pressurized gas, and one side of that plate is heated, the gas flows from the cold side to the hot side. This accumulation of gas on the hot side of the plate causes the pressure to build up on the hot side, and the plate moves. But the squares of metal in the Light Mill aren't porous. Instead of thermal transpiration, the plates experience what's called thermal creep. At the very edges of the plate, the gas in contact creeps toward the hot side. Since black absorbs photons, it is hotter than the silver side, and the gas creeps to the black edge. The edge then gets a tiny kick of pressure, and the mill spins. This is why the glass has to be evacuated of all but the barest traces of gas. The entire thing is powered by a few molecules of gas at the edge of each of the tiny paddles. If it had to fight through regular air pressure it wouldn't spin. Thermal creep isn't just applicable in physics toys. Many people have seen liquid helium creep up the sides of its container. This and other superfluids, all of which have to be pretty cold to be fluid at all, will creep up walls towards heat. Thermal creep and thermal transpiration are the driving force of toys now, but they may not always be. Consider the vast nebulas that litter the universe, many of them filled with forming stars. The combination of dense gas and light are a great combination for thermal transpiration as a power system. A literal space ship, with giant porous, adjustable sails, might be able to push itself around by getting a star to heat its sails unevenly and gas to push its way through them. The Light Mill might be the ancient toy that inspires a legitimate form of transport.